If you’re coming to New Zealand, download the free Thrifty Travel NZ app which is a great companion to your Thrifty rental. The app pin points your GPS location then shows you nearby petrol stations, public toilets, real-time road alerts/warnings, supermarkets, dangerous roads, things to do, accommodation and much more. 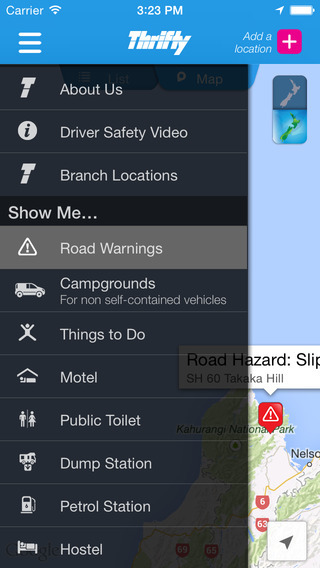 You can even view our driver safety videos within the app, to help you understand what it’s like to drive in New Zealand.